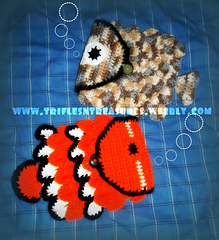 5" x 8", 6" x 9", and 8" x 10"
Options for generic fish, as well as clownfish are included! Also includes strap option, and 3 different sizes for finished bag! techniques in my pattern, and included a mini picture tutorial in the pattern for visual assistance. Gauge can be adjusted for a wider range of sizes by using different sized hooks, and different weights of yarn. This pattern works up beautifully in Caron Simply Soft!